Playing bingo at a bingo hall can be a fun way to pass the time, but wouldn’t you rather avoid the hassle of getting ready, driving to the venue, and dealing with the noise and the cigarette smoke? Wouldn’t you rather play bingo while in your robe and/or pyjamas while relaxing in your favourite chair or your bed? WIN UP TO 500 SUPER SPINSNew Customer Offer. T&Cs Apply. 18+. Please Gamble Responsibly. If you want to play a great game, then have a go on Lucky Cow Bingo. There is a range of offers and promotions available. Lucky Cow Bingo gives you the chance to do just that. This gaming site is one of the newest bingo games on the internet and they are determined to gain a reputation for big wins and great bonuses. You can get up to 500 free spins when you join this site, see more offers similar to that on this page. While all of that sounds fine and good, it can be hard to pick an online site that meets all of your requirements for great promotions, fun games, fast payouts, etc. This task is made even harder because of the sheer number of bingo sites on the net. So to make things easier, consider this comprehensive review of LuckyCowBingo.com’s bonuses, promotions, and other important information to see how they stand up to their competitors. 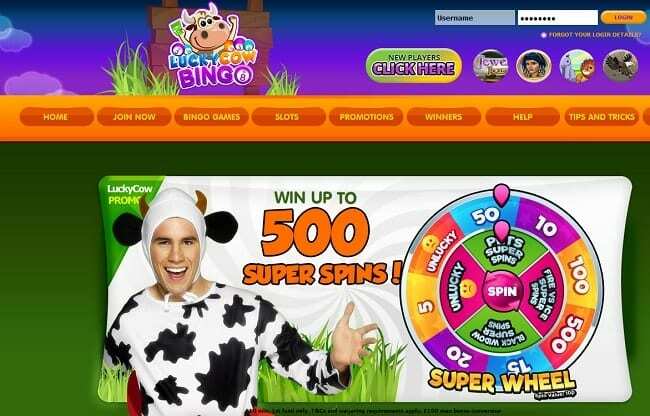 LuckyCowBingo.com is part of the WSN Bingo Network and is owned and operated by Jumpman Gaming Limited, who is licensed and regulated in Alderney to provide the services on this site. Their software was developed by a team of expert in-house developers who aim to continuously upgrade the software and provide gamers with unbeatable gaming experiences. As well as getting the chance to play a decent selection of bingo, table games, scratchcards, and games, you will also get a chance to spin their big wheel and win bonus prizes. Gameplay ticket prices vary from free to 1 pound each. The operators of LuckyCowBingo.com are dedicated to providing players with the best gaming experience on the web. But if you are ever unsatisfied and for any reason, you can either email their support team or call them anytime between 9:30 am and 6 pm. If you have decided to give LuckyCowBingo.com a try, the minimum deposit is 5 pounds. Also, only amounts of 10 pounds or more will be eligible for deposit bonuses. The withdrawal amount minimum is 30 pounds and the process takes about 3 days– the first two days your withdrawal will be in pending mode, which gives you plenty of time to reverse the withdrawal if need be. Once the two days are up, the funds will be processed and will be available on the next working day. But, it’s important to note that it can take up to 14 working days for the money to reach your specified card.